Persecution of the White Lotus Society started during the Yuan Dynasty (Mongols 1271 – 1368). Due to this, the White Lotus Society changed from one of peace and tranquility and organized protests against the Mongol rulers, the first non-Han to rule China. Since Yuan Imperial authorities distrusted the White Lotus Society, the Dynasty banned them, and the White Lotus went underground. The White Lotus also started to predict that a messianic (Christ like) figure would come and save them from persecution. A White Lotus led revolution started in 1352 around Guangzhou. A Buddhist monk, Zhu Yuanzhang, joined the rebellion. Soon, he became the leader by forbidding his soldiers to pillage, in observance of White Lotus religious beliefs. By 1355, the rebellion had spread through much of China. 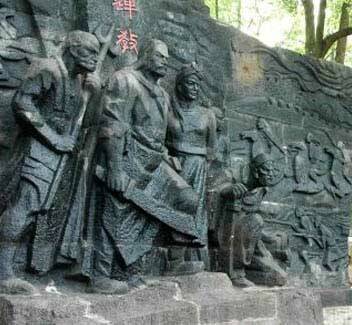 In 1356, Zhu Yuanzhang captured Nanjing and made it his capital. Then Confucian scholars issued pronouncements supporting Zhu’s claim of the Mandate of Heaven, the first step toward establishing a new dynasty. Zhu Yuanzhang liberated China from the Mongols and became the founding Emperor of the Ming Dynasty (1368 – 1643). At this point, you may see the danger of allowing a religious cult like the White Lotus to have any power. This entry was posted on Saturday, April 24th, 2010 at 08:00 and is filed under China, Chinese Culture, Chinese history, politics, religion. You can follow any responses to this entry through the RSS 2.0 feed. You can leave a response, or trackback from your own site.